I picked this up at a Halloween/spooky middle grade books-themed event at Books of Wonder, and boy, was it appropriate for the event. The Cavendish Home for Boys and Girls is one of the scariest, most twisted children’s books I’ve ever read. The super ominous first half is bad enough, but the horror really gets going in the second half, after Victoria is committed to the Home. LeGrand hurls pretty much every phobia you can name at the reader, and makes up a few for good measure. (Word of warning: if you have a big problem with bugs, do not read this book.) The children in the Home are subjected to both physical and psychological torture, and the outlandishness of the villains and the shifting, supernatural Home can’t disguise the gruesomeness of some of that torture. I’ve taken books to task before for going too far – for attempting to push the envelope into “scary” and ending in “gross and inappropriate.” And make no mistake: The Cavendish Home for Boys and Girls contains actual torture of children. Yet for the most part, I think it treads on the appropriate side of the line for its age group. Why? Well, for starters, it’s extremely well-written, and what comes off as tacky and gross in a poorly-written book is a chillingly effective scene in a well-written one. But more importantly, it’s a horror book through and through, while most of the books that I think go too far are horror-comedy, and ask you to laugh at violent and the macabre. It’s precisely LeGrand’s commitment to pure, stomach-turning horror that makes The Cavendish Home work; the book never asks you to be anything but upset by all its upsetting scenes. The children are tricked into cannibalism. That last, however, is the only thing that really gave me pause over whether this book is appropriate for the audience. The rest of it, because it’s more trippy and psychological than physical, is still scary but not out of line. Certainly I would be careful about what kid you give this book to, though; many middle grade readers can handle it, but I would have had screaming nightmares for weeks. So why did I pick it up, if I’m so skittish about horror? (You’ll notice the “Horror” tag on this blog is not super-well populated.) It was the description of Victoria herself that drew me in. She’s the kind of character who would be a minor antagonist in any other children’s book: prim, uptight, competitive, organized to an almost pathological degree. She’s viciously determined to be the head of the class no matter what, and is, it must be admitted, controlling, smug, and judgmental. I loved her to pieces. First of all, she’s a very different protagonist than your usual free-spirited oddballs, and just that change was nice. Second, I must admit I see more than a little of myself in her. I’m more like her now than I was as a scuffy-looking kid who never brushed her hair, but it was still a comfort to read about a protagonist whose uptight Type-A-ness borders on the pathological, and I think Victoria could end up meaning a lot to the kids out there whose issues mirror hers and who don’t often find themselves as the subjects of books. Third, I loved that though Victoria certainly learns to cool it on the judgmental, controlling aspects of her personality, it’s still that very personality – her stubbornness, her bossiness, her unerring conviction in her own rightness – that enables her to save the day. 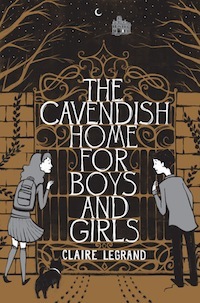 Again, The Cavendish Home for Boys and Girls is not for the faint of heart, but it’s an excellent read if you like your plot twists dark and your heroines atypical and prickly. Four and a half cupcakes. This entry was posted on Wednesday, January 16th, 2013 at 4:35 pm and is filed under 4.5 Cupcakes, Contemporary/Urban Fantasy, Horror. You can follow any responses to this entry through the RSS 2.0 feed. You can leave a response, or trackback from your own site.